Ascertainment of the Three Types of Vows (སྡོམ་གསུམ་རྣམ་ངེས་, Wyl. 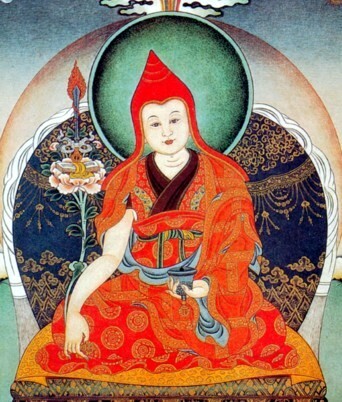 sdom gsum rnam nges) — an important treatise on the three sets of vows from a Dzogchen perspective by Ngari Panchen Pema Wangyal (1487-1542). སྡོམ་གསུམ་རྣམ་ངེས་ཀྱི་རྣམ་བཤད་པཎ་ཆེན་དགོངས་པ་རབ་གསལ་བཻ་ཌཱུར་དཀར་པོའི་འོད་སྣང་སྐལ་བཟང་འཇུག་ངོགས་ཀྱི་སྔ་དུམ།, sdom gsum rnam nges kyi rnam bshad paN chen dgongs pa rab gsal bai DUr dkar po'i 'od snang skal bzang 'jug ngogs kyi snga dum/, gsum 'bum Vol 5, p.3. སྡོམ་གསུམ་རྣམ་ངེས་འབྲུ་འགྲེལ།, sdom gsum rnam nges 'bru 'grel/, Dudjom Rinpoche gsum 'bum, Vol 4, p.7. This page was last edited on 4 February 2017, at 00:56.